A quick way to improve dwindling storage media capacity is to hunt down those items that consume the most space. These are large files, some of which you might not be aware of. For example, purging a downloaded movie from your PC’s hard drive could gain you 4GB of storage. Press Win+E to bring forth File Explorer. The File Explorer opens, displaying the Quick Access items. Click the address bar and choose your account name from the menu. Click the right‐pointing chevron (>) on the left end of the address bar. Your account name appears in the list. On the author’s PC, it’s Dan. 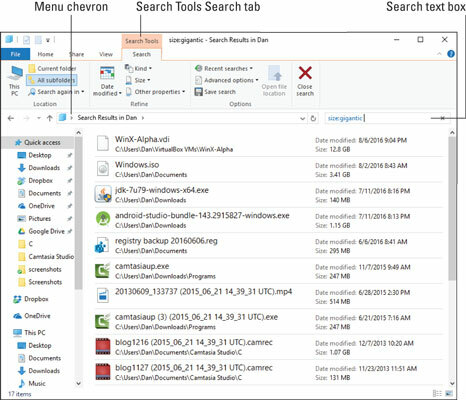 Click the Search text box, located near the upper‐right corner of the File Explorer window. When you click the box, the Search Tools Search tab appears, as illustrated. On the Search Tools Search tab, in the Refine group, click the Size button and choose Gigantic. The Search Results window updates to show gigantic files found in your storage area on the hard drive. The files are sorted largest first, as illustrated here. You can gawk at the list, but the point is to find larger files that you can remove and free up the space they occupy. You may see files you downloaded or created ages ago — something you needed once but no longer. If so, great: You can delete or archive the file. To delete a file, select it in the Search Results window and then press the Delete key on the keyboard. This action sends the file to the Recycle Bin, which doesn’t really delete it. Only when you empty the Recycle Bin is the file’s space freed. Archiving is best when you may still need the file but don’t need to have it handy. To archive a file, you can move it to external storage or compress it. To move the file, select it and press Ctrl+X to cut it. Then open a folder window on an external drive or a media card. Press Ctrl+V to paste the file, moving it to the media. • You can press Shift+Delete to instantly delete a file and recover the storage space used by the file. The Shift+Delete operation isn’t reversible, however. Use it with care. • You may find some compressed (Zip) folders when perusing the list. Be careful! You want to confirm the compressed folder’s contents before you whisk it off into oblivion.